The Venerable Hakuyu Taizan Maezumi Roshi (known as Taizan Maezumi) (February 24, 1931—May 14, 1995), was a Zen Buddhist monk who had a seminal influence on the growth of Zen Buddhism in the United States. Born in 1931, Maezumi Roshi was ordained as a Soto Zen monk at the age of eleven. He received degrees in Oriental Literature and Philosophy from Komazawa University and studied at Sojiji, one of the two main Soto monasteries in Japan. 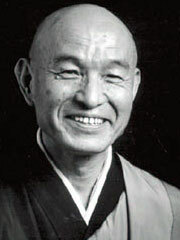 He received Dharma transmission from Hakujun Kuroda, Roshi, in 1955. He also received approval as a teacher (Inka) from both Koryu Osaka Roshi and Hakuun Yasutani Roshi, thus becoming a Dharma successor in three lines of Zen. In 1956, Maezumi Roshi went to Los Angeles as a priest at Zenshuji Temple, the Soto Headquarters of the United States. He devoted his life to laying a firm foundation for the growth of Zen Buddhism in the West. In 1967, he established the Zen Center of Los Angeles (ZCLA). Its honorary founder is Baian Hakujun Daiosho, who headed the Soto Sect Supreme Court and was one of the leading figures of Japanese Soto Zen. Maezumi Roshi established six temples in the United States and Europe that are formally registered with Soto Headquarters in Japan. In addition to ZCLA, these include Zen Mountain Center in California; Zen Community of New York (at which the Abbot is Tetsugen Glassman); Kanzeon Zen Centers of Salt Lake City, Utah and Europe (at which the Abbot is Genpo Merzel); and Zen Mountain Monastery in New York (at which the Abbot is John Daido Loori). Affiliated centers also include the Great Mountain Zen Center in Colorado (where Shishin Wick is the teacher), Zen Community of Oregon (where Chozen Bays is the teacher); Three Treasures Zen Community in San Diego (where Jikyo Miller is the teacher); Centro Zen de Mexico, Coyoacan (where Tesshin Sanderson is the teacher), Centro Zen de la Cuidad de Mexico and Hazy Moon Zen Center. In addition, there are over fifty groups in the Americas and Europe that are affiliated with ZCLA. In 1976, Maezumi Roshi established the Kuroda Institute for the Study of Buddhism and Human Values, a non-profit educational organization formed to promote scholarship on Buddhism in its historical, philosophical, and cultural ramifications. The Institute serves the scholarly community by providing a forum in which scholars can gather at conferences and colloquia. The Institute also publishes a book series with the University of Hawaii Press devoted to the translation of East Asian Buddhist classics and presentations of scholarly works from its conferences. Maezumi Roshi also founded the Dharma Institute in Mexico City. Maezumi Roshi founded the White Plum Asanga, named after his father Baian Hakujun Daiosho. Maezumi Roshi transmitted the Dharma to twelve successors: Bernard Tetsugen Glassman (NY), Dennis Genpo Merzel (UT & Europe), Charlotte Joko Beck (CA), Jan Chozen Bays (OR), John Daido Loori (NY), Gerry Shishin Wick (CO), John Tesshin Sanderson (Mexico), Alfred Jitsudo Ancheta (CA), Charles Tenshin Fletcher (CA), Susan Myoyu Andersen (IL), Nicolee Jikyo Miller (CA), and William Nyogen Yeo (CA). These twelve successors have further transmitted the Dharma to nine «second-generation» successors. In America, Maezumi Roshi ordained 68 Zen priests and gave the lay Buddhist precepts to over 500 people. As a major contribution to the transmission of Buddhist teachings to the West, Maezumi Roshi was instrumental in bringing to realization the formation of the Soto Zen Buddhist Association (SZBA) of American Soto Zen teachers. Maezumi Roshi also promoted exchange programs among priests and lay practitioners between the United States and Japan. He had published commentaries on major Buddhist works, and his collected works will be published posthumously. At the age of 64 Maezumi Roshi died suddenly in Tokyo, Japan in the early morning hours of Monday, May 15 (Japanese time), 1995. Shortly before his death, Maezumi Roshi gave Inka to his senior disciple Tetsugen Glassman, Roshi, who in turn transmitted Inka to Genpo Merzel, Roshi, the present President of the White Plum Asanga. Genpo Roshi in turn has transmitted Inka to John Daido Loori, Roshi. Maezumi Roshi is survived by his wife Martha Ekyo Maezumi and their three children, Kirsten Mitsuyo, Yuri Jundo and Shira Yoshimi, all of Idyllwild, CA. Intimate funeral services and cremation were held in Tokyo, Japan on May 19 to 20, 1995. The main funeral was held on Sunday, August 27, 1995 in Los Angeles, CA.